You might be interested to get a compressor for your personal or business use. We bring you just about the right cheap compressor deals which will work for your budget and your lifestyle. Get access to awesome compressor product options on amazingly great discounts plus you get to choose from the most reliable online retailers. Get only the most reliable products from Amazon, eBay, and other popular UK sellers. Take advantage of the latest deals, discount codes, and offers available online. Enjoy massive savings when you browse for quality compressor selections from trusted brands. 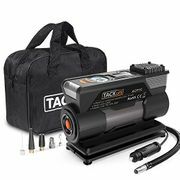 Universal 12 Volt Air Compressor £4.99 Delivered. 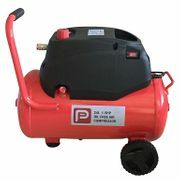 An air compressor is a device that converts power through the use of an electric motor, diesel, and gasoline among others, into potential energy stored in pressurised air. By one of several methods, an air compressor forces more and more air into a storage tank, increasing the pressure. When tank pressure reaches its engineered upper limit the air compressor shuts off. The compressed air, then, is held in the tank until called into use. The energy contained in the compressed air can be used for a variety of applications, utilising the kinetic energy of the air as it is released and the tank depressurizes. When tank pressure reaches its lower limit, the air compressor turns on again and re-pressurises the tank. An air compressor must be differentiated from pump because it works for any gas/air and pump work on liquid. There are plenty of ways to save on your purchases online. Most online UK shops such as Amazon, My Memory, Currys, and Menkind have regular sales, seasonal clearance, and flash sales where you can get up to 30% off on a wide array of quality cheap compressors. There are even retailers that have 3 for 2 and 2 for 1 offers on select items. Also, the best time to get huge savings is during Black Friday, Cyber Monday, and Boxing Day where an extensive selection of products like petrol and garage compressor from your favourite UK retailers are reduced to clear. Knowing when and where to look for the lowest possible price on all types of compressors is the key here. Fortunately, you don't have to spend hours online searching for air compressors for sale, special offers, bargain deals, and price drops. Our massive community of bargain hunters regularly share verified air compressor Aldi discounts, as well as promos and voucher codes from Car Parts 4 Less, Euro Car Parts, Argos, eBay, and from other reputable shops across the country. 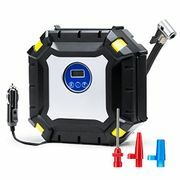 We also have a team of money-saving experts who always share essential tips and tricks on how you can get every day low prices on 50L, 100 litre, and 200 litre air compressor for sale when shopping both online and instore. Getting additional money off with the help of Latest Deals is easy. You can maximise your savings by simply using the latest compressor discount code of your choice upon check out. There are also voucher codes that can provide you with free shipping and gifts. Supplying high-pressure clean air to fill gas cylinders. Supplying moderate-pressure clean air to a submerged surface supplied diver. Supplying moderate-pressure clean air for driving some office and school building pneumatic HVAC control system valves. Supplying a large amount of moderate-pressure air to power pneumatic tools, such as jackhammers, filling high pressure air tanks (HPA), for filling tires, and to produce large volumes of moderate-pressure air for large-scale industrial processes. Most air compressors either are reciprocating piston type, rotary vane or rotary screw. Centrifugal compressors are common in very large applications, while rotary screw, scroll, and reciprocating air compressors are favored for smaller, portable applications. There are two main types of air-compressor pumps: oil-injected and oil-less. The oil-less system has more technical development, but is more expensive, louder and lasts for less time than oil-lubed pumps. The oil-less system also delivers an air of better quality. Air compressors are designed to utilize a variety of power sources. 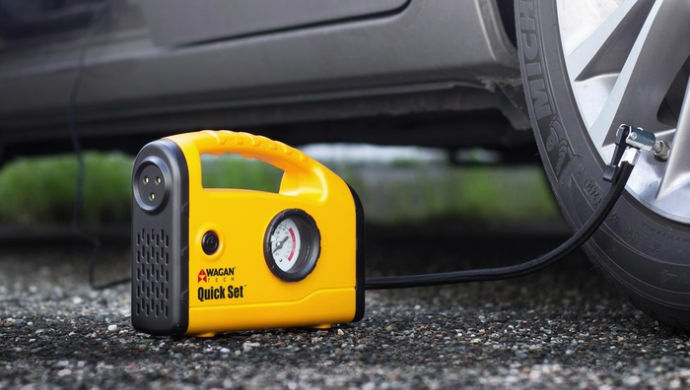 While gas/diesel-powered and electric air compressors are among the most popular, air compressors that utilize vehicle engines, power-take-off, or hydraulic ports are also commonly used in mobile applications.